If you’re looking to send out fundraising letters asking for donations, pledges, and support, you might be wondering where to start. These are just a few of the questions that you might have when it comes to using a fundraising letter template to ask for support. Luckily, we have answers to your questions! You can tweak each of these templates to suit your specific needs and circumstances. These letters can also be modified to be used as email appeals, as well! 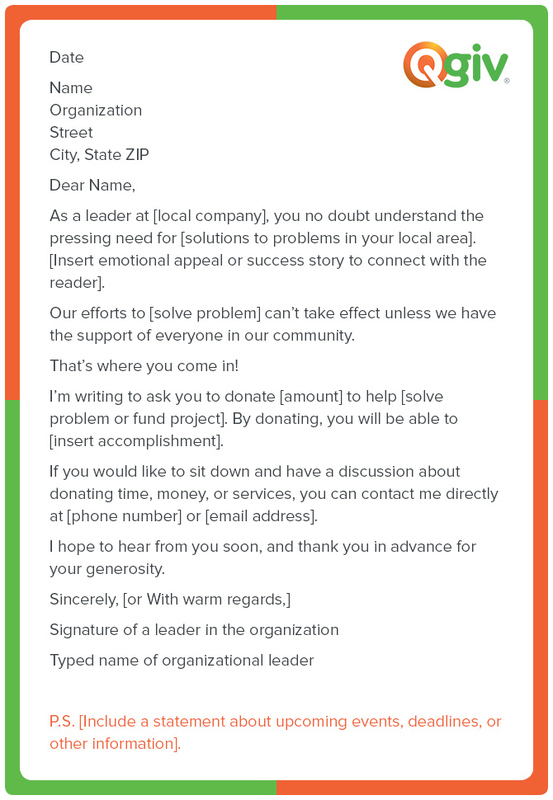 Let’s look at each fundraising letter template separately. And for help with asking for donations in general, check out our Ultimate Guide! If you’re asking for donations with letters, you’ll need to have a standard format that can be used as a baseline for all of your other donation request letters. 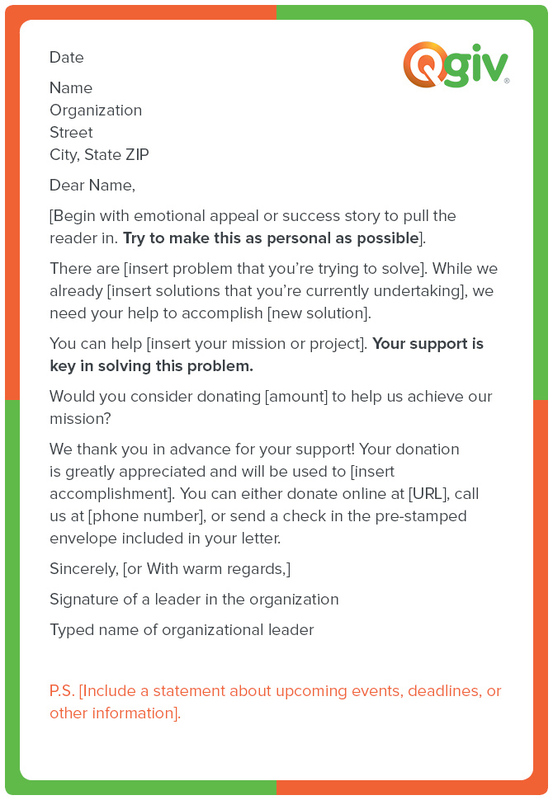 The template we’ll go over in this section will be generic, but your fundraising letters should be segmented depending on your relationship with the recipient. First-time donors should receive different letters than major gift donors, one-time donors should get different letters than recurring donors, and so forth. The key to successful fundraising asks (especially in this format!) is sending your donors appeals that are as relevant as possible to their experiences with you. Tweak this base template for different audiences! [Begin with emotional appeal or success story to pull the reader in. Try to make this as personal as possible]. There are [insert problem that you’re trying to solve]. While we already [insert solutions that you’re currently undertaking], we need your help to accomplish [new solution]. You can help [insert your mission or project]. Your support is key in solving this problem. Would you consider donating [amount] to help us achieve our mission? We thank you in advance for your support! Your donation is greatly appreciated and will be used to [insert accomplishment]. You can either donate online at [URL], call us at [phone number], or send a check in the pre-stamped envelope included in your letter. P.S. [Include a statement about upcoming events, deadlines, or other information]. Download the standard donation request template! As you can see, this letter is quite short and gets right to the point of asking for a donation. Your letter will obviously be more specific and detailed depending on your mission and the projects that you’re fundraising for. Letters should be donor-centric. Make sure your donors know what their donation will go toward and how they can help. The letter isn’t about your organization–it’s about your donors. Try a quick test to see how donor-centric your content really is: circle the “you” language (you, yours, etc.) with a red pen. Circle “us” language (us, we, our) in black. Your red circles should outnumber your black circles! Keep it short and sweet. Donors don’t want to read a novel in your fundraising letter. Get to the point–you only have one page! If you’re telling a great story and need to use an extra page, bold the important parts and make sure to break up your paragraphs. It’s imperative that longer letters be easy to scan. Don’t forget the self-addressed and stamped envelope. Don’t make donors work to support you! Including a return envelope will greatly increase the chances that your donors will actually make a contribution. Make it easy for them to give and they’ll continue to do so in the months to come. Make sure someone signs the letter. Having a signature at the bottom of the letter lends an air of professionalism and adds a personal touch. Make the signature legible. If donors won’t know exactly who your “sender” is, include a short description of their job title or involvement with your organization. Add a P.S. message. Most readers absorb a letter in this order: the salutation, the P.S. message, and then the body of the letter. Since the P.S. is the second thing they read, it’s important that you use it to make an impact. It’s the perfect place to reiterate your call to action (where you ask people to give, volunteer, or whatever else you want them to do). 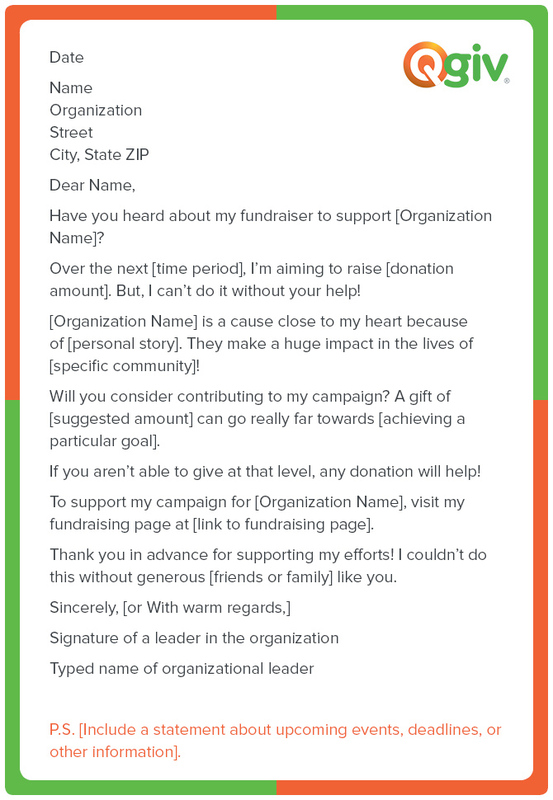 Use this template as a starting point to create a great fundraising letter for asking for standard donations from individuals! Sponsorship letters are similar to standard donation letters. The only difference is that sponsorships are usually tied to events like marathons, walk-a-thons, and fun runs. The sponsor’s name included in promotional items and advertising materials. Certain merchandise related to the event. Seats or tickets to the event. Our [event] will take place on [date] at [place]. This event will [insert accomplishment or purpose] and our goal is to raise [amount]. We’re currently looking for sponsors who would be willing to help us reach this goal. Can we count on you to donate [amount] to help? As a thank-you for your generosity, we would like to offer you [incentive]. Please include your donation in the self-addressed envelope included in this letter or donate online at [URL]. Thank you in advance for your contribution. We hope to see you at [event]! Download the individual sponsorship request template! The same tips for standard donation requests also apply here. Make sure that the sponsorship letter is donor-centric, personal, and includes a self-addressed and stamped envelope. 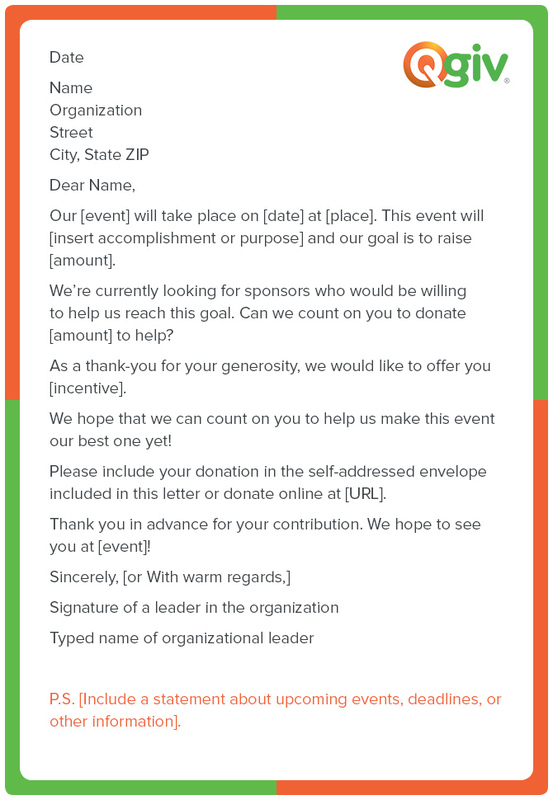 Use this template to obtain sponsorships for your next fundraising event! Sometimes, a letter can be used to ask for time, not money. Instead, we’d like to invite you to get involved at our [next volunteer day]. We’ll be [insert what will be accomplished during the volunteer day], and we could really use your help! We’re so excited to have you join our volunteer team! Thank you in advance for your dedication and service to [demographic you serve]. Download the volunteer time request template! A volunteer letter should focus on the work that a volunteer would be able to accomplish should they choose to support your organization with your organization, and it should also let them know how their work will influence the people or community you support. Volunteers are often more familiar with your organization due to their involvement. If you’re writing a letter to someone that you know has a history of volunteering with your organization or other nonprofits, reference that involvement and thank them for their service. Use this template for requesting volunteer time from your biggest supporters. The previous three letters have been more geared toward asking individuals for donations. But letters can be extremely useful when asking corporations, businesses, and companies for support. As a leader at [local company], you no doubt understand the pressing need for [solutions to problems in your local area]. [Insert emotional appeal or success story to connect with the reader]. Our efforts to [solve problem] can’t take effect unless we have the support of everyone in our community. I’m writing to ask you to donate [amount] to help [solve problem or fund project]. By donating, you will be able to [insert accomplishment]. If you would like to sit down and have a discussion about donating time, money, or services, you can contact me directly at [phone number] or [email address]. I hope to hear from you soon, and thank you in advance for your generosity. Download the corporate donation request template! Note that the letter asks for an in-person meeting with the leader of the organization. The company you’re writing to may be hesitant to give money to a nonprofit they’re unfamiliar with. An in-person meeting can greatly help your fundraising efforts. It allows the business leader to ask questions, express concerns, and become more familiar with your organization. Again, this letter can be modified to suit your organization’s mission and needs. Use this template the next time you ask a local company for a donation! While these last few templates have shown you how to ask supporters to donate their time or money to your nonprofit, this next template will show your supporters how to call on their friends and family to show love to your cause. 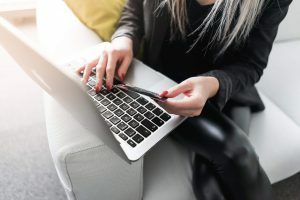 Peer-to-peer fundraising campaigns are one of the most effective ways for your nonprofit to raise money and spread the word about your mission online. Your supporters will launch personalized fundraising pages on behalf of your cause, and then they’ll reach out to their personal networks to solicit gifts. 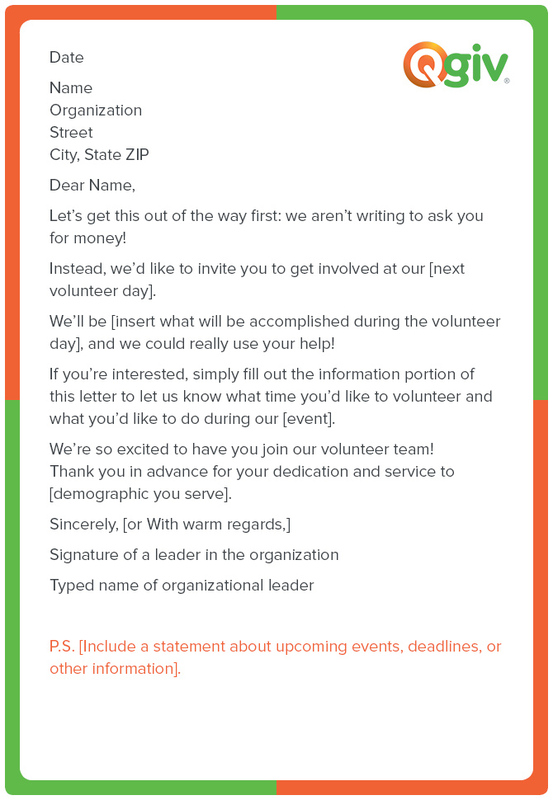 To give your peer-to-peer fundraising volunteers an idea of how to solicit these gifts, offer them up a template like this one. By filling in the blanks, they’ll easily be able to craft unique solicitations. Have you heard about my fundraiser to support [Organization Name]? Over the next [time period], I’m aiming to raise [donation amount]. But, I can’t do it without your help! [Organization Name] is a cause close to my heart because of [personal story]. They make a huge impact in the lives of [specific community]! Will you consider contributing to my campaign? A gift of [suggested amount] can go really far towards [achieving a particular goal]. If you aren’t able to give at that level, any donation will help! To support my campaign for [Organization Name], visit my fundraising page at [link to fundraising page]. Thank you in advance for supporting my efforts! I couldn’t do this without generous [friends or family] like you. Since many of your peer-to-peer fundraising volunteers are new to soliciting gifts, offering them a template like this early on in their fundraising journey can be really helpful. Your team could even create different templates for different audiences they might speak to. For example, you may draft a template for asking a coworker for a peer-to-peer fundraising gift. Or, your supporters might find it useful to see a template for asking a family member for a gift. When they sign up and start their page, you can consider sending out donation request templates like this one to help them get started. If you’re using Qgiv, these are easy to create! You can include them in your participants’ fundraising dashboards, which will give them instant access to them in the emails section of their sharing tools. You can also upload templates as resources that are available to participants in their dashboards. No matter what, always ensure your peer-to-peer fundraising volunteers are equipped with the tools and know-how they need to successfully raise money for your cause. Your nonprofit wouldn’t reach its goals without their support, so don’t leave them hanging! Not all of your supporters know about matching gifts programs, or even if their employer offers matching gifts. This is why your nonprofit should plan to send letters to your matching gifts-eligible donors that outline the process of sending in a matching gift request and completing the matching gifts process. Your letter should introduce them to the concept of matching gifts as well as offer actionable steps they can take to ensure their donation is matched. As you prepare to send your letters, search a matching gifts database to determine which of your donors qualify for a matching gift. Then, create a donor segment list in your CRM of these special supporters. Did you know you can double the impact of your latest gift to [Organization Name] for free? Matching gifts programs are programs sponsored by employers like [donor employer name] that offer to match charitable contributions to certain causes. [Employer name] has a matching gifts program in place, and your latest gift of [gift amount] is ready to be doubled! All you need to do is send in a matching gift request. 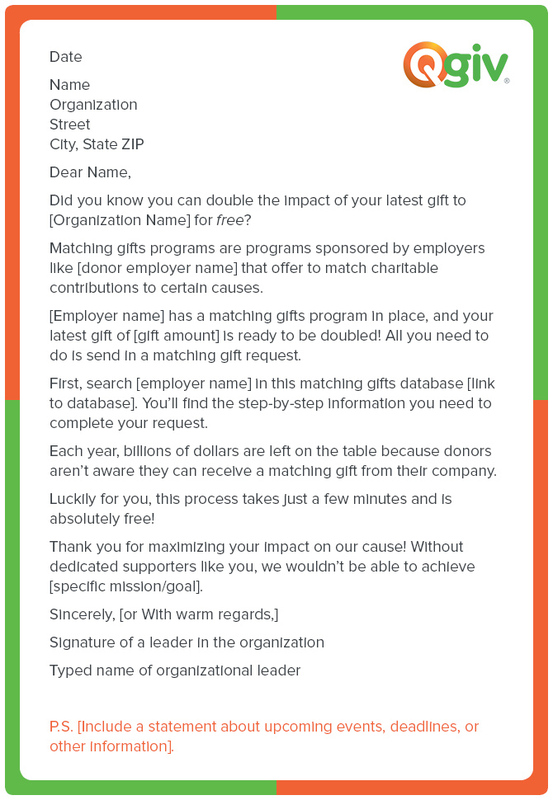 First, search [employer name] in this matching gifts database [link to database]. You’ll find the step-by-step information you need to complete your request. Each year, billions of dollars are left on the table because donors aren’t aware they can receive a matching gift from their company. Luckily for you, this process takes just a few minutes and is absolutely free! Thank you for maximizing your impact on our cause! Without dedicated supporters like you, we wouldn’t be able to achieve [specific mission/goal]. Remember to emphasize to your donors how easy it will be for them to get the ball rolling with sending in their matching gift request. Additionally, be sure to highlight that submitting this request will not require any further giving on their part. Underscore that submitting this request is the best way for them to maximize the impact of their original gift and is essentially free money for your cause. Keep your matching gift request short, sweet, and to the point. Once they finish reading your letter, you’ll want them to have all the knowledge they need to complete their request successfully. If the matching gifts request process is made as intuitive as possible, they’re more likely to pursue matching gifts in the future. While we typically think of all nonprofit organizations as traditional charities, that often leaves schools out of the picture. In fact, schools are among the most common nonprofit organizations out there with an incredibly wide range of constituents. This is why it’s so important that schools take their fundraising needs seriously and plan ahead for how they’ll request donations from community members. Your school should create templates for different kinds of donation letters based on the type of supporter you’re addressing. Perhaps you’re soliciting a gift from a parent of a current student. Alternatively, you might want to draft a template of a solicitation addressed to an alumnus. At [School Name], our first priority is making sure we’re able to give [student name] the tools they need to learn and grow. In [year], our community needs to raise [amount] to be able to achieve our goal of [specific goal]. If we can get [number] parents to donate [donation amount] before [date], we’ll be well on our way to our fundraising goal this year. When parents like you give back to our school’s community, [School Name] is able to lay the groundwork for future student achievement. Thank you for being such a supporter of student success! 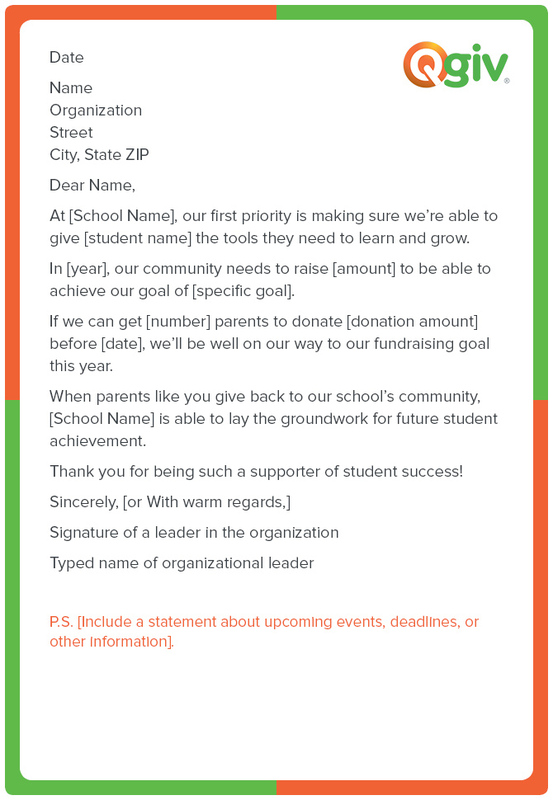 When creating your school fundraising letter template, your nonprofit should emphasize the impact your school has on the next generation of your community. Since the vast majority of students are young people, your nonprofit can easily tap into your reader’s emotional connection to the student body of your school. If the recipient is a parent, then you’ll have an even easier time making the case for them to donate. School fundraising letters should be as specific as possible to illustrate to potential givers that you’ll use their contributions well. For example, you might send out a specific fundraising letter campaign focused on raising money for your school’s clubs. Finally, make sure that you take into account the giving capacity of your letter recipients before asking for a gift. For example, parents or alumni of a private school may be able to donate more than members of a public school’s community. Fundraising for your church can be really tough, especially when you’re asking for gifts outside of regular tithing. 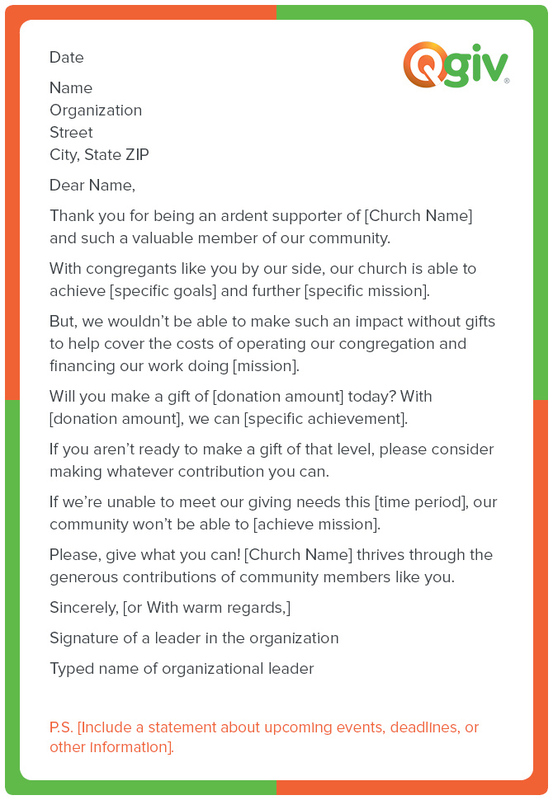 In your church fundraising letters, be sure to put your congregation’s mission first and foremost. You’ll want to immediately address your congregant’s sense of duty and make the most out of your existing relationship with this individual. 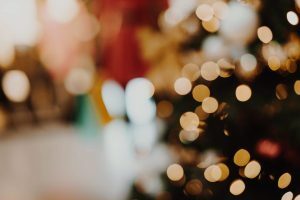 Your reader may already make collection plate gifts each Sunday, so you’ll have to make the case for them to donate a more targeted gift outside of these offerings. Be sure to tell them exactly how much you need to raise and how that funding will be put to work. Thank you for being an ardent supporter of [Church Name] and such a valuable member of our community. With congregants like you by our side, our church is able to achieve [specific goals] and further [specific mission]. But, we wouldn’t be able to make such an impact without gifts to help cover the costs of operating our congregation and financing our work doing [mission]. Will you make a gift of [donation amount] today? With [donation amount], we can [specific achievement]. If you aren’t ready to make a gift of that level, please consider making whatever contribution you can. If we’re unable to meet our giving needs this [time period], our community won’t be able to [achieve mission]. Please, give what you can! [Church Name] thrives through the generous contributions of community members like you. One of your church’s biggest giving needs is your annual fund (i.e. the money set aside to cover operational expenses for your congregation). Since you’ll need to secure a continual stream of funding for these expenses, be sure to send out church fundraising letters regularly. At the beginning of the year, create a fundraising letter calendar to plan out what letters you’ll send, when, and to which groups. However, always be wary of asking your community for gifts too frequently. One strategy to minimize the risk of over-asking for contributions is to switch off between fundraising groups. For example, in February you might send letters to older congregants asking for Valentine’s Day-related contributions, while in June you could contact parents of children in your church and ask for a gift to celebrate their kids’ summer vacation. Need to find more donors to give to your animal rescue organization? Sending out fundraising letters is a great start! Animal rescue organizations serve an important role in your community, and you can leverage that to your advantage when writing a donation request letter. Additionally, tap into your readers’ emotional connection to animals to make the case for why they should give back. In your letter, show supporters how their contributions will benefit specific animals. Personify the pets that you rescue and illustrate for your readers the massive impact they can make in an animal’s life if they decide to donate. Did you know that [Animal Rescue Name] gives shelter to over [number] of animals every year? To keep our doors open, feed animals in need, and offer crucial veterinary care, our rescue needs to raise [fundraising goal] before [date]. If you make a gift of [donation amount], that will feed [number] of animals for [time period]! A gift of [donation amount] could even give [veterinary procedure] to [number] of animals this year. With the support of community members like you, animals like [real animal name] have been able to find their forever homes. Even better, if we reach our fundraising goal this [time period], we’ll be able to expand our services to [number] of animals in the [community name] area. Will you make a difference in an animal’s life today? 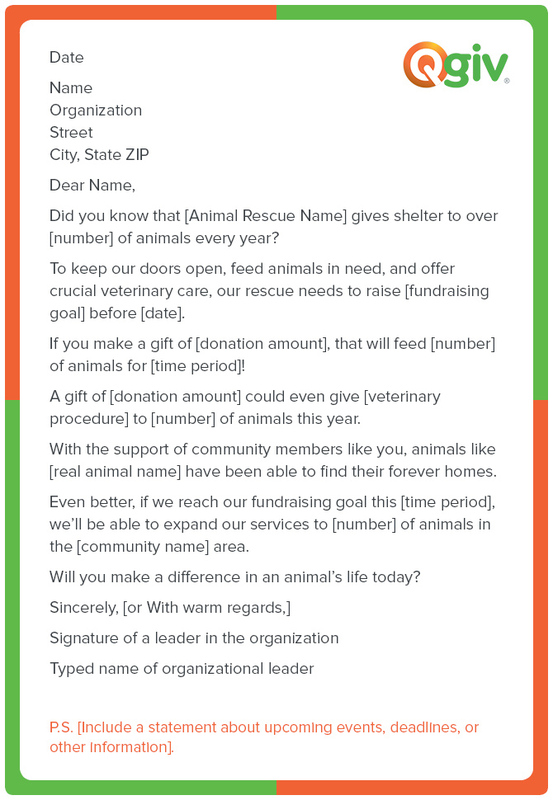 There are a number of ways your animal rescue organization can make its fundraising letters stand out to supporters. In your letter, you can share images of real-life animals saved by your rescue. Include a caption with their name and age as an added way to pull at your supporters’ heartstrings. After they donate, send a thank-you letter with a follow up on these pets to emphasize the impact of their donation. Your animal rescue should also send tailored letters to different groups in your community. These could include individuals who adopted pets from your rescue, volunteers, or helpful members of the community who have dropped off lost or stray animals at your shelter. The more you tailor these fundraising letters to your animal rescue’s supporters, the more likely it is readers will decide to donate! Need to brush up on how to thank your donors? Learn how to show your donors love with our guide to thank-you letters. Want to go back to the basics of fundraising before using a fundraising letter template? Get some answers to your most frequently asked fundraising questions. Coaching your supporters with materials for peer-to-peer fundraising? Make sure you’ve got the fundamentals of peer-to-peer fundraising down. What about you? What types of letters or emails does your organization send out? Let us know in the comments!